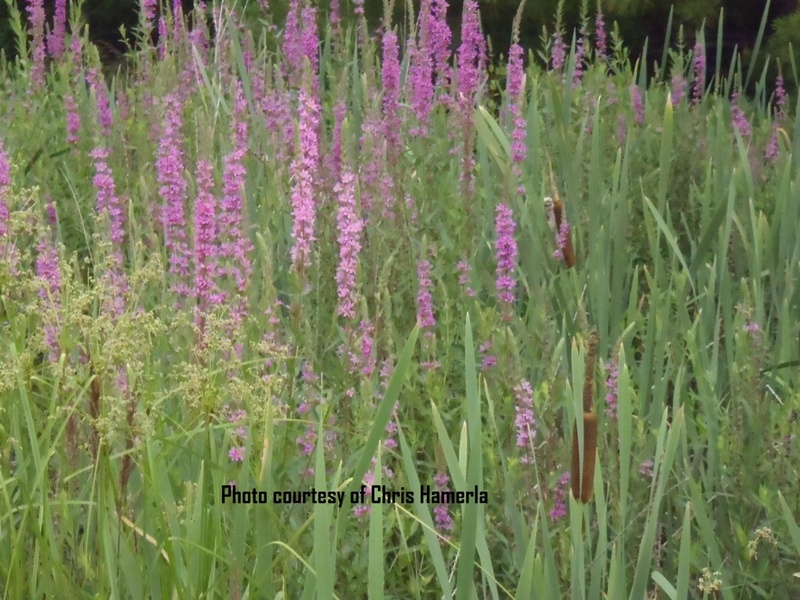 Purple Loosestrife is a wetland perennial plant that originally arrived here from Europe and Asia. It was distributed and sold by plant nurseries because of its attractive purple flowers. People then planted this species in their yards, gardens and lake front properties. The plant itself can produce 100,000 to 2,000,000 seeds annually and is easily dispersed by nature. The seeds have a 60 to 70 percent survival rate and often can sprout several years after being dropped. In its native land the plant is not found in large numbers because of native insects and pathogens. In Wisconsin loosestrife grows faster and taller than native wetland plants which then shade out most other plants in the area. This plant is easily identified with a purple spike flower head, semi-woody square stem, and lance shaped often opposite or whirled leaves.